Will Stroll DNF before the McLarens or after? Please feel free to be creative with your responses. Let's give the kid a chance....will he be the next Maldonado or Verstappen? or somewhere in between? He entered the Ferrari Academy at a young age....11 and has proven himself in F4 and F3 so looking at him right now...I would say he is about average. Massa will definitely put him away. Its a learning curve and the Stroll will definitely be in the "Stroller" seat this first year. However, Massa is not the same as he once was in 2008(even then thats debate-able) albeit father time. Williams are definitely in a pickle....a rookie and a has been. I say the Macca's DNF at OZ given their recent history in testing....its unfortunate. Last edited by jgonzalesm6; 14th March 2017 at 21:47. Rob Smedley: "Melbourne will be tough enough for him — new track, limited practice and the walls are closer than in Barcelona." There you go, those damn walls to close to the road. Surely a design mistake, its not the kids fault if he hits it. Senna never proved more than having good family sponsor money$$. Check his career record. A win or 2 at an easy track and then back to the back! Massa a has been returning! Following the example of Shumy's great return to Merc ! I just couldn't resist also putting up a rediculous post ! Before probably, the kid is a walking disaster. obviously way WAY out of his depth, but you know. His rich daddy bought him a seat to play with. Ridiculous? Just for the record, I didn't say Senna had no talent: merely that, without his dad's money, he'd never get a chance to race in Europe. That's a fact, no matter if you don't like it. The real answer is neither... it secret option 3.. in between, cause one of the Mclarens wont start the race... the stroll will go on a stroll... then the second McLaren will DNF. I would be pleased if Stroll does well and especially so if he learns how to GET OUT OF THE WAY of our guys and other front-runners. The same goes for van Doorne because Alonso has much experience (and manners) in this regard already. It took more than a free ride to europe from his old man to be the driver Senna was. He was going there already great! Eles disseram que ele era da infancia " O rei da chuva! Lewis also achieved his greatness in F1 without needing a shot in the arm from his old man or anyone else. 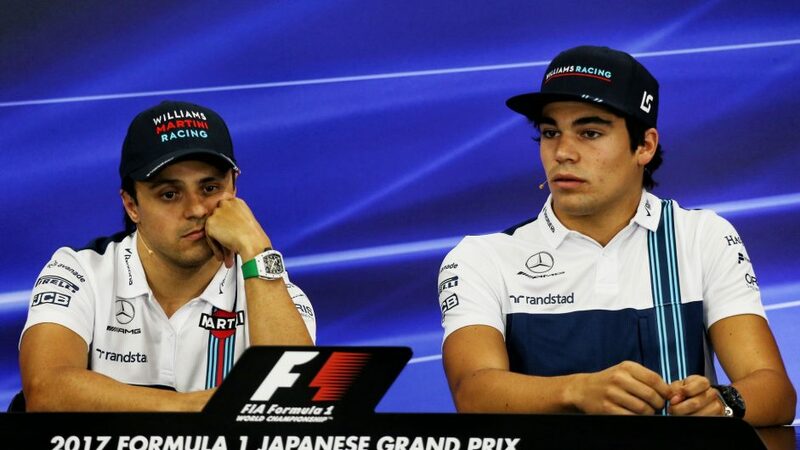 While I'm at it, I wish Stroll success @ Williams alongside a retired has been, Felipe Massa! Stroll might be responsible for the first safety car of the season, but he won't need to keep out of the way of the Mclaren boys. They are the new last cars in F1.....just how long before they blow an engine is still up in the air. finish gives him the confidence to achieve and evolve. I never thought of Stroll as a terribly bad racer to be honest. He only had one DNF that was his fault. Other DNF's were because of technical issues and Sainz hitting him like a mad man. In other races he was terribly slow but not reckless as people thought of him. However, with more experience he'll gain more confidence and probably become a faster racer. Will he become a great racer? Can't know, really. Time will tell. If Stroll had Massa's car problem he would have been on podium anyway. A car problem means nothing , it's the driver. Threre's always the "T" car in F1 if you want to really finish the race. Shame on Massa!! Never a fan of when pay to play drivers have success. It gives them the idea that they are their because of "skill" more so than money. Daddy's money in this case. Wait... What? I don't think we have had the T-car in F1 in a decade or so. How exactly would Stroll finish the race with a broken rear suspension? The kid can barely keep the car out of other cars and walls when its 100%. Stroll is reigning European F3 champion so he can drive. Hope his season proceeds well from now on. Correct! Broken suspension, impossible to continue. But in Massa's case his DNF was because he's a has been not the car! He was to old to fix the problem and continue. he would fall back(playing it safe) only to end up in front of his team-mate. Nevertheless, double-pts for Williams in Monza. Spa???? I honestly don't think a commentator or any footage over the telee even mentioned him. Stroll was probably in a state of shock winding up on the front line! 5th place would have been a dream spot to start. I wish him well and no one better than Felipe as a team mate to guide him along. I guess on the playstation, it does'nt have cool down laps? My guess is that he is too young to promote alcohol in Japan. BIIIIIIINNNNNGGGGOOO! winner winner chicken dinner! Funny thing though, in your mind they might as well be the same as Felipe's. Is 25 the required age for advertising alcohol in EU?? I don't know about the EU? But in Japan, he is underaged.